Learn about the emergency lighting options to keep your building up to code. Having emergency lights in your building is required by law for many reasons, the key reasons being that emergency lights provide occupants with a quick and easy escape route. The exit route for businesses must be continuous and unobstructed for safety reasons, as keeping employees and customers safe in the event of an emergency is most important. Continue reading to learn about emergency lighting options to ensure your building is up to code. Emergency lighting must provide enough light to be clearly visible, and your exit routes should always account for power failures during an emergency situation. The type of emergency lighting a building needs depends on building type and their operations. For instance, typical installations such as apartments, office buildings, and retail stores use regular lighting, as they do not have extreme weather or hazardous materials. In locations with high humidity and water, such as a gym with an indoor pool, waterproof lighting is required. Warehouses and public venues that are exposed to vandalism require industrial lighting, while facilities with hazardous chemicals require hazardous lighting that is protected. Different situations require difference emergency signs and lights and come with specific requirements. For example, exit signs have size requirements that buildings must follow: at least 6 in high, while the word “Exit” must be clearly visible and easy to read, and at least ¾ of an inch wide. 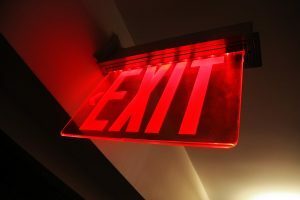 Under national regulations, exit signs can be any color, but local regulations may require specific colors, as most buildings typically stick to bright red exit signs. Exit signs are used to lead occupants outside of the building safety, but they can also be used to mark emergency exit routes. It’s crucial to mark your doors correctly, as “No Exit” signs on doors and stairways that don’t lead outside are just as important as exit signs in an emergency situation. Clearly marking your doors and stairways is essential to keeping occupants on the safest route, rather than guessing which doors will lead them out of the building. Fireline offers emergency and exit lighting inspections and maintenance as part of our Totally Integrated Protection Solutions. We have been protecting people and properties from fire damage since 1947—and our experience shows in our excellent work! We are known for our wonderful customer service, our expertise, and our reliability. For more information on how we can help your residential or commercial property, visit us online or give us a call at (800) 553-3405. For more fire safety tips, be sure to follow us on Facebook, Twitter, LinkedIn, and Google+. This entry was posted on Tuesday, April 3rd, 2018 at 4:25 pm. Both comments and pings are currently closed.